Master raconteur and author of the upcoming book The Storyteller’s Secret, Carmine Gallo talks about struggle, persuasion and the importance of sharing stories. 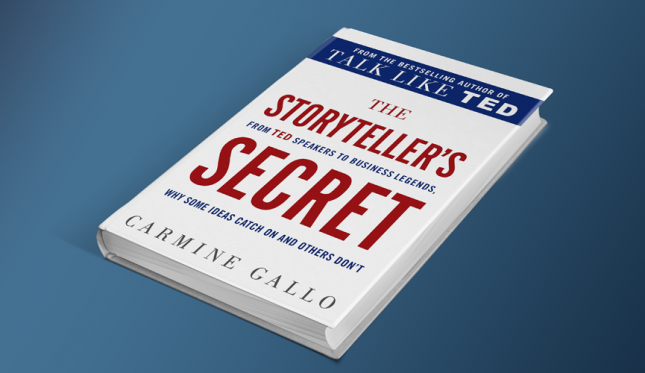 In The Storyteller’s Secret, Carmine Gallo explains how some of the most powerful people in business are those willing to share the struggles they’ve faced. Gallo spoke with Worth about the narratives behind successful brands and leaders. WHAT MADE YOU DECIDE TO WRITE SPECIFICALLY ABOUT STORYTELLING? I wrote Talk Like Ted (2014), which I viewed as a public-speaking book. Very few people will actually ever give a TED talk. But I wanted to identify what it is about some of the world’s greatest public speakers—how did they go about delivering these presentations that went viral? There are a lot of elements about how to prepare and how to rehearse. But the chapter that really caught on was about storytelling. SO FOR YOUR LATEST BOOK YOU TALKED TO EXPERTS ON STORYTELLING? I spent the better part of two years just researching stories and narratives, talking to people who have the title of company storyteller, and talking to neuroscientists, anthropologists and researchers about why we have to tell more stories in business and how it affects the brain. Google has a chief storytelling officer who is one of the leading experts in web analytics in the world. But he told me, “We can have the greatest data in the world, but if we can’t show you how that data is going to make your company better, or help you succeed as an individual, then it doesn’t matter.” At Nike, there are “corporate storytellers” who talk about innovation and the spirit of innovation that is part of Nike’s legacy and history. I don’t think you necessarily need to have someone you designate as a storytelling officer, but if you are in leadership today, one of your roles should be chief storyteller. IS IT NECESSARY TO INCORPORATE STORYTELLING WITH DATA? That’s what the most recent data from neuroscientists shows. If even at Google, at one of the most data-focused centers of the world, they need a storytelling officer, the rest of us certainly do. SO IT’S DEFINITELY IMPORTANT TO HAVE THE ABILITY, OR AT LEAST HAVE SOMEONE IN YOUR COMPANY WITH THE ABILITY, TO TELL A STORY? Salespeople are trying to capture customer stories and use those to win new business. One of the best ways we have of winning new business is by showing people how we’ve helped others. But you need to capture those stories somehow. That’s why I think it’s valuable [to have storytellers] because the CEO can’t always do that. People don’t have to be good storytellers in terms of their own public personas, but I think they need to have someone on staff to help them capture and disseminate those stories. HOW CAN PEOPLE USE STORIES TO CREATE PUBLIC PERSONAS FOR THEMSELVES? Everybody can tell you the story of Howard Schultz, right? He grew up poor, in the projects of Brooklyn, not being able to make ends meet when his father got injured on the job. He said that if he was ever in the position to help other people, that he would do that. That’s one of the reasons why Starbucks was one of the first to offer part-time employees stock options and health benefits. He is a good storyteller, and he is using his own personal narrative of struggle and hardship to reinforce the values that the company brings to the table today. There are heartwarming stories behind every slogan and tagline. But you have to identify what it is about your company or your product that you’re really passionate about. The stories are what send the videos viral, the stories are what get shared, not the data. WHAT ARE THE MOST IMPORTANT ASPECTS OF A STORY? When people have a sense of purpose or meaning, and they see that their company stands for something more, it makes a deeper emotional connection with them. We get into the corporate world, and we get the data, and we think we have to impress people with the numbers. It’s a matter of re-learning what the ancient brain knows better than anything: to make an emotional connection with people we have to lower the shield. When you are trying to get people to think differently about a subject for which they’ve probably already made up their mind, you have to give them a shift in perspective. WHO DO YOU THINK ARE SOME OF THE BEST STORYTELLERS TODAY? I believe that Steve Jobs was the greatest business storyteller of our time. If you look back at the Steve Jobs presentation in 1984 when he introduced Macintosh, and then in 2007 when he introduced the iPhone, it’s all story. He’s got a villain. In 1984 the villain was the competitor—IBM. This was dramatic stuff; it was like a movie. Then in 2007, the villains were the “usual suspects”—the other smartphone competitors. Bill and Melinda Gates are great storytellers. Melinda Gates has said publicly that it’s important to tell the stories of the children and the people they’re helping in different countries, because that’s how you’re going to see this money in action.